If you’re not familiar with the group, the 2008 documentary The Rock-afire Explosion can fill you in on its meteoric rise to fame in the 1980s, where it covered pop hits for a dedicated fanbase of Coked-up little-kids heckling them with fumbled, little-kid swear words while they ate cardboard pizza. 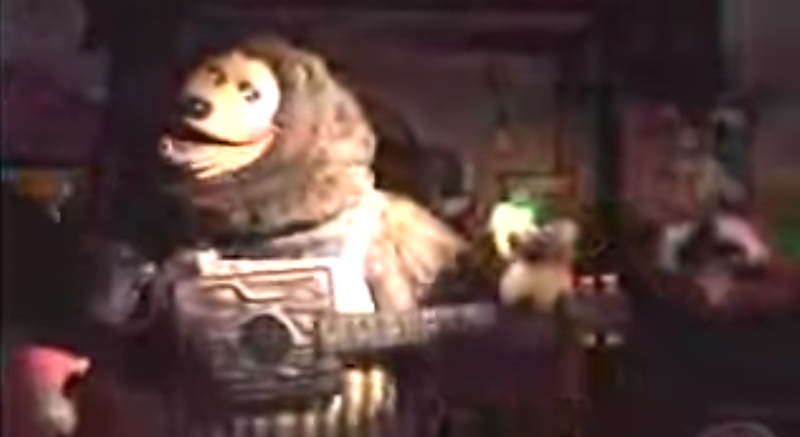 The animatronic animals were the house band for ShowBiz Pizza Place, a onetime rival to Chuck E. Cheese that eventually swallowed that bankrupt company, rebranding itself under its more famous name—a merger that also meant chucking the Showbiz characters and replacing them with Chuck E. Cheese’s own musicians. The documentary covers that rise and fall from greasy grace, as well as the efforts by the Rock-afire’s wunderkind creator, Aaron Fechter, and a Mountain Dew-slamming Showbiz fanatic named Chris Thrash to rescue the robots and reprogram them for viral fame, performing the songs of the 21st century by request on YouTube. I don’t know what it is about “Pop, Lock, And Drop It,” specifically, that makes it, for me, the ne plus ultra of videos where these jerky, probably musty relics of birthday parties past swim out of my childhood memories to do mid-’00s songs in some guy’s garage. I’m not particularly a fan of—or even familiar with—Huey or his original version, let alone the remix that’s playing here. But there’s something about the marriage of material and machine that’s endlessly replayable: Mitzi Mozzarella’s cheerleader calisthenics on the chorus. The way Billy Bob widens his eyes on the line “Or even if it’s rrreal.” The way drummer Dook LaRue’s ears blast upward on that synth note. And especially the expert timing of frequently sidelined Rock-afire sideman Rolfe De Wolfe and his puppet pal Earl, who trade off on T-Pain’s verses, without and with Auto-Tune.